Sumitomo Heavy Industries introduces new small gear motor | News - Fiscal 2009 | Sumitomo Heavy Industries, Ltd.
Sumitomo Heavy Industries, Ltd. (President: Yoshinobu Nakamura) announced the start of sales of the single-phase series of Prest Neo parallel-shaft small gear motors. Sales will begin this July 1. 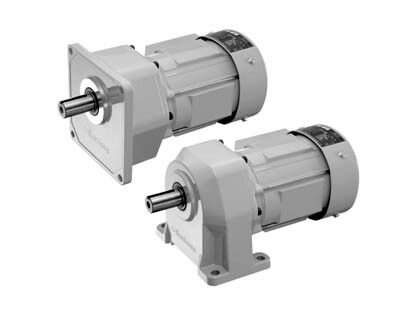 IN-Line small gear motors are widely used to drive various mechanical devices, including food-processing, packaging, and welfare equipment, as well as small conveyors. Incorporating involute gears,* the Prest Neo is characterized by low noise and simple design. Sales of Prest Neo began in April 2008. In response to customer demand in recent years for single-phase power sources for goods such as food-processing and agricultural equipment, Sumitomo Heavy Industries proceeded to develop a version of the Prest Neo for use with single-phase power. The newly introduced Prest Neo has achieved both sound levels low enough for use inside restaurants or ordinary stores and high starting torque (280% of rated torque). Sumitomo Heavy Industries will propose this newly developed series as a solution for food-processing, agricultural equipment, and other automated machinery requiring single-phase power. * Prest is a registered trademark of Sumitomo Heavy Industries. * Involute gears :Gears characterized by a rounded trapezoidal shape; the shapes of gear teeth are based on involute curves (similar to the track of the end of a thread unravelled from a reel). This new capacitor start induction motor features both remarkably low noise and high starting torque in a compact form factor. High component performance for each rotating component and optimized electromagnetic design means lower overall operating noise. Speed reducer components achieve low operating noise through high contact ratios and increased casing rigidity. Bearings with high load capacity and a very rigid casing realize an output shaft capacity radial load approximately 20% greater than existing products (Altax), further boosting design flexibility for customers. To prevent contamination and provide reliability to customers in the food and drink industries, where single-phase gear motors are widespread, all models in the series use the most reliable thermohardened powder coating standard. Automation equipment using single-phase power sources, including food-processing equipments , agricultural equipment, arcade machines, and assisted-living devices.